Jack Morris was born on Monday, May 16, 1955, in St. Paul, Minnesota. 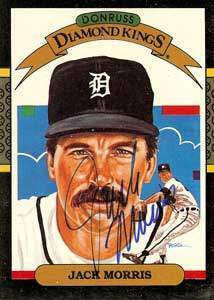 Morris was 22 years old when he broke into the big leagues on July 26, 1977, with the Detroit Tigers. His biographical data, year-by-year hitting stats, fielding stats, pitching stats (where applicable), career totals, uniform numbers, salary data and miscellaneous items-of-interest are presented by Baseball Almanac on this comprehensive Jack Morris baseball stats page. Did you know that Jack Morris pitched in exactly three Fall Classics and won three World Series rings with three different teams - the 1984 Detroit Tigers , the 1991 Minnesota Twins , and the 1992 Toronto Blue Jays ? The five-time All-Star ( 1981 , 1984 , 1985 , 1987 & 1991 ) pitcher gave up the most hits, the most earned runs, and the most home runs of any pitcher across the entire decade of the 1980s; however, he also started the most games, pitched the most innings, and had the most wins of any pitcher in that same decade! Coming off the biggest season of his young career when he posted a 20-13 record and led the league in strikeouts in 1983, 28-year old Jack Morris was making just his second start of the year when he met the Chicago White Sox on Saturday April 7 at Comiskey Park. It was the fourth game of the season for Morris' undefeated Detroit Tigers. A crowd of 24,616 was on hand to watch Morris (1-0) tangle with Floyd Bannister . Having mastered the split-fingered fastball the previous year, the hard-throwing Morris was no match for the defending American League West champions. Getting several outstanding defensive plays from his teammates, Morris made the heavy-hitting White Sox look helpless as he struck out eight, walked six and allowed just four balls to be hit to his outfielders. Morris breezed through the first three innings, retiring the first nine batters he faced. He had a brief scare when Rudy Law led off the first with a line drive to right. But Kirk Gibson made a one-handed, running catch near the wall. Morris then struck out Carlton Fisk and Harold Baines . Morris ran into serious trouble in the fourth. Law opened the inning with a walk and promptly stole second. Fisk and Baines also walked to load the bases with none out. But Morris got Greg Luzinski to slap a checkered-swing bouncer back to the mound for the start of a 1-2-3 double play. Ron Kittle struck out to end the inning. The Tigers had taken a 2-o lead in the second on Chet Lemon's two-run homer following a walk to Lance Parrish . They added their final two runs in the fifth. Back-to-back doubles by Lemon and Gibson got one run, and after Tom Brooken's sacrifice bunt, Gibson beat the throw home on Lou Whitaker's fielder's choice grounder to second. Morris walked Vern Law with one out in the fifth, but got Scott Fletcher to pop out to second and Julio Cruz to pop out to first. The Tigers' hurler fanned Rudy Law and Fisk and got Baines on a ground out to third in the sixth. In the seventh, Luzinski opened with a walk. One out later, Tom Paciorek crushed a line drive that Dave Bergman , just inserted at first as a defensive replacement, snared with a leaping catch. Pinch-hitter Greg Walker ended the threat by grounding out to first. Bergman came to Morris's rescue again in the eighth when he dropped to his knees to knock down a smoking grounder by pinch-hitter Jerry Hairston . After Morris took the throw at first for the out, he set down Cruz on a grounder to the mound and Rudy Law on a roller to first. Morris had to face the heart of the White Sox order in the ninth. He retired Fisk on an easy bouncer to Bergman and Baines on a hard hopper back to the mound. The ever-dangerous Luzinski then drew a walk on a 3-2 pitch, but Morris came back to strike out Kittle on a 1-2 pitch. It was over. The White Sox had been no-hit for the second time in their last seven regular seasons games. ( Mike Warren blanked them at the end of the 1983 seasons). Morris went on to post a 19-11 record for the seasons. He would win 94 games and over a five-year period between 1983 and 1987 for the Tigers. From 1980 through 1993, Jack Morris was the starting pitcher on Opening Day , the most consecutively by any pitcher in history. From 2000 to 2003, Morris never received greater than 30% of the Baseball Hall of Fame votes. He received 40% of the vote for the first time in 2006. In 2010, he received 52.3% of the vote. In 2012, he received 67% of the vote, and in 2013 he received 67.7% of the vote. On January 8, 2014, Morris received 61.5% of the vote in his last year of eligibility, and can now be considered for the Veterans Committee Expansion in 2017. Would you put Jack Morris in the Hall of Fame (tell us on Baseball Fever )?